NOTE: 1.6.0 removes some blocks Lighting blocks and chimneys were removed - they will be in separate mods. Project: Vibrant Journeys is a Minecraft mod that aims to add some spice to survival without changing its core aspects. Instead of adding tons of new content in one direction, this mod focuses on adding content that overlays the current style of survival. Here, you will not find complex machinery, or magical spells, or a billion biomes, or too many dimensions to remember. You will find new building materials, new places to explore, and new monsters to slay. It does not aim to revamp or change the focus of survival, but rather to enhance it. Also comes with full support for Biomes O' Plenty and Traverse! Find all the info on this mod in the GitHub wiki. Can ducks be bred with each other? If not, could that be a possibility? Minecraft has gotten so weird. You can breed cows with each other, where are the bulls? You can breed sows with each other, where are the hogs? Now, this mod allows you to breed drakes together, where are the ducks? Yep, they can be bred with seeds. Hi! I was wondering if it was possible to disable just the flies? Thank you! They can be disabled by setting the fly spawn weight to 0 in the config under the entities category. Hi, sorry to bother you again. I think the amount of snails and spiders spawning is preventing regular vanilla animals from appearing as much. I'd like to turn the spawn rate down, but I'm not sure whether higher or lower values mean lower spawn rates. Lower values lower the spawn rates. The spawn rates for the bugs have been an ongoing issue for a while. I can't seem to tune them right and they aren't part of the animal category so they shouldn't be affecting the way animals spawn. If you find values for the spawn weights that seem to work well, please let me know! if you added more bugs, you would see less of the same exact bugs and then the amount of insects dont matter because it would be a diverse array of things. i'd personally like to see tiny solifugae for deserts, & fulgoridae pretty much everywhere else. I've fixed the spawn rate for bugs in the last update. More bugs are planned! Which ones? You right click groundcover while sneaking to pick it up. How does the biomes work, because I found overgrown biomes with none foundations crossing a river, please, stop doing more and fix your biomes generation first. I love the overgrown cosmetic of this mod, but some plants are really out of aesthetic, comparing with the rest of the mod, to me silverleaf and sundew. 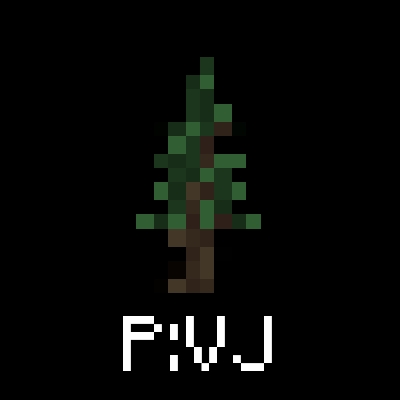 Out of that, I'm trying with Fist of Flesh mod to don't start punching trees but for some reason your trees bypass the mod, how to they work, don't keep me wrong, I love the aesthetic of the your trees and the so lightweight of your mod, but there several things that need a check on the compatibility. The thing with the overgrown spires biome was unintended, but I like it so I'm keeping it. Everything can be disabled, so if you don't like certain plants or other things then disable them. As for the fist of flesh mod, that compatibility issue is theirs to deal with. Given that it has only one release from last year, it's probably been abandoned. This mod keeps crashing the whole game in the Roguelike Adventures and Dungeons modpack. Is there any way to disable it so I can actually play, or can y'all fix it? Disable all mobs from the master setting in config, and if keeps crashing, biomes too. That's an issue that's been fixed in a recent update of this mod, however the modpack has not been updated yet to include that fix. You can swap out this mod from the modpack and replace it with the updated one.